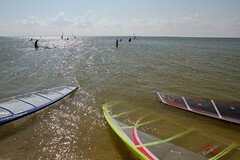 The first Wind Addict trip of 2011 is April 22-24 in Corpus Christi. If you don't yet know how to windsurf, this is your opportunity to get introduced. If you do know how to windsurf, you should get out of town and enjoy the water. If you have not windsurfed before, you'll want to schedule classes at Worldwinds. Almost all of my surfing friends have learned how to windsurf from them. Just be sure to show up to your class early (see the 5 easy steps). I'm staying at the Best Western on the Island this time. This hotel is located on North Padre Island across the street from a mini-golf course, and right next to the Packery Channel Park. Consult the 5 easy steps to windsurfing happiness to get started.